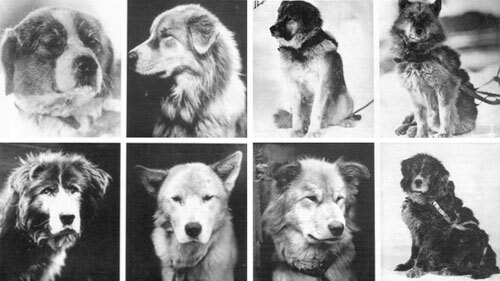 Names of the dogs | Shackleton. “I do not know who had been responsible for some of the names, which seem to represent a variety of tastes. All the dogs except eight had been named. “Rugby, Upton, Bristol, Millhill, Songster, Sandy, Mack, Mercury, Wolf, Amundsen, Hercules, Hackenschmidt, Samson, Sammy, Skipper, Caruso, Sub, Ulysses, Spotty, Bosun, Slobbers, Sadie, Sue, Sally, Jasper, Tim, Sweep, Martin, Splitlip, Luke, Saint, Satan, Chips, Stumps, Snapper, Painful, Bob, Snowball, Jerry, Judge, Sooty, Rufus, Sidelights, Simeon, Swanker, Chirgwin, Steamer, Peter, Fluffy, Steward, Slippery, Elliott, Roy, Noel, Shakespeare, Jamie, Bummer, Smuts, Luipold, Spider, and Sailor.